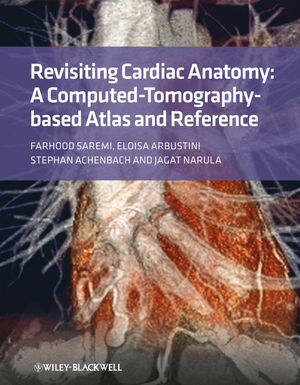 This new atlas represents a fresh fresh approach to cardiac anatomy, providing images of unparalleled quality, along with explanatory text, to show in vivo heart anatomy and explain the clinically relevant underlying anatomic concepts. In spite of amazing proliferation of information on the Internet and multiple websites filled with up-to-date information, there is no similarly detailed and systematic compilation of morphological imaging with CT. Organized for both systematic learning and to serve as a quick, yet detailed reference for specific clinical questions, this book is an invaluable resource for medical students and residents, cardiologists, and especially surgeons, interventionalists and electrophysiologists, who depend on ever more detailed imaging support in order to successfully perform increasingly complex coronary and noncoronary structural interventions and other procedures. Chapter 1: Anatomy of the Heart for a Dissector (Farhood Saremi & Damian Sanchez-Quintana). Chapter 2: Anatomical and Pathophysiological Classification of Congenital Heart Disease (Carla Frescura, Emanuela Valsangiacomo Buchel, Siew Yen Ho & Gaetano Thiene). Chapter 3: CT in Pediatric Heart Disease (Hyun Woo Goo). Chapter 4: Mitral and Aortic Valves Anatomy for Surgeons and Interventionalists (Horia Muresian). Chapter 5: Clinical Applications of CT Imaging of the Aortic and Mitral Valves (Hatem Alkadhi, Lotus Desbiolles & Sebastian Leschka). Chapter 6: Computed Tomography for Percutaneous Aortic Valve Replacement (Hursh Naik, Niraj Doctor, Gregory P. Fontana & Raj R. Makkar). Chapter 7: Mitral Valve Disease Imaging (Javier G. Castillo, David H. Adams & Mario J. Garcia). Chapter 8: The Aortic Root (Fabiana Isabella Gambarin, Massimo Massetti, Roberto Dore, Eric Saloux, Valentina Favalli & Eloisa Arbustini). Chapter 9: CoronaryAnatomyforInterventionalists (Stephan Achenbach). Chapter 10: Coronary Anatomy for Surgeons (Farhood Saremi, Amir Abolhoda & Gustavo Abuin). Chapter 11: Anatomy for Electrophysiologic Interventions (Farhood Saremi & Damian Sanchez-Quintana). Chapter 12: Coronary Atherosclerosis: CT Imaging for the Preventive Cardiologist (Stephan Achenbach & Jagat Narula). Chapter 13: Nomograms for Coronary Computed Tomographic Angiography (Leslee J. Shaw, James K. Min & Daniel S. Berman).